artistANDcook | Unique Artist. Painter. Photographer. Graphic Designer. & I just love to Cook! Unique Artist. Painter. Photographer. Graphic Designer. & I just love to Cook! 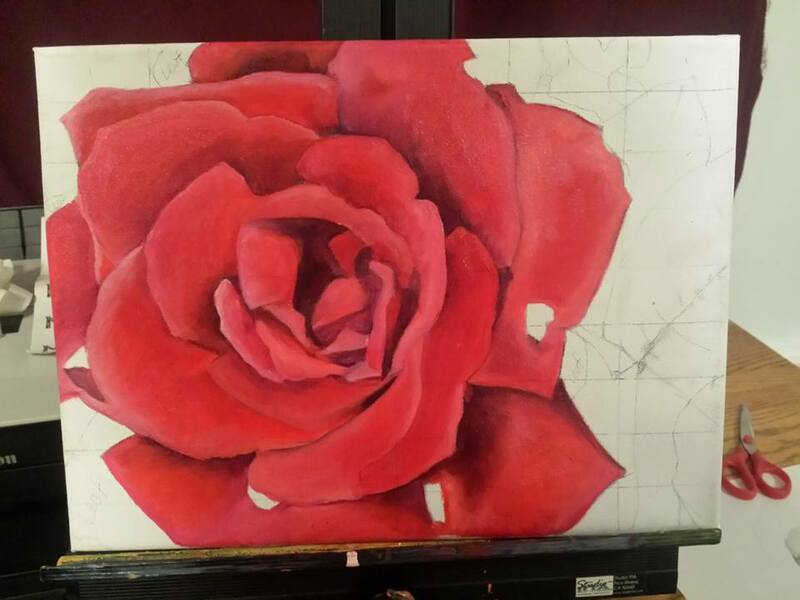 I’ve found myself with great fascination and connection to Alice in Wonderland’s song “Painting the Roses Red” since I started painting my three rose painting series in 2015. It’s funny how in life we sometimes find ourselves with one kind of something but yet we need it to be something else. These poor guys (the cardsmen) are desperately trying to make white roses red because they need the queen to be happy. Literally NEED, not just want, her to be happy or OFFFFFFFFF with their heads. It’s life and death. They are frantically terrified but still singing and having a good ole time painting the roses red. The humor is quite TWISTED when you think about it. So we are painting the roses red. “If she saw white instead. Would quickly lose his head. Painting the Roses Red. And so It begins with the song. Yeah well that’s my version at least . The version that played through head for at least 20+ hours on autoplay and repeat. I can honestly say I didn’t go crazy But rather fully embraced the song as part of the learning process of my project for advanced painting class. I decided to paint something small for my first series because normally when I paint I tended to paint the ocean and the sky – two INFINITE beings. Yes I called them beings – I’m not sure they can just be called things. So by painting something as small as a rose I’m forcing myself to paint something I see that is the complete opposite from my painting comfort zone. I mentioned earlier this whole scenario seems kind of twisted. So the song goes to sing that even though the “cardsmen” are painting the roses red they know this will kill the roses and roses will die soon. Even with this knowledge they continue to paint the roses red to postpone the wrath of the queen. And they do it with SONG!!!! They embrace the reality of their end, their demise, happily WITH SONG. See the twisted irony????? 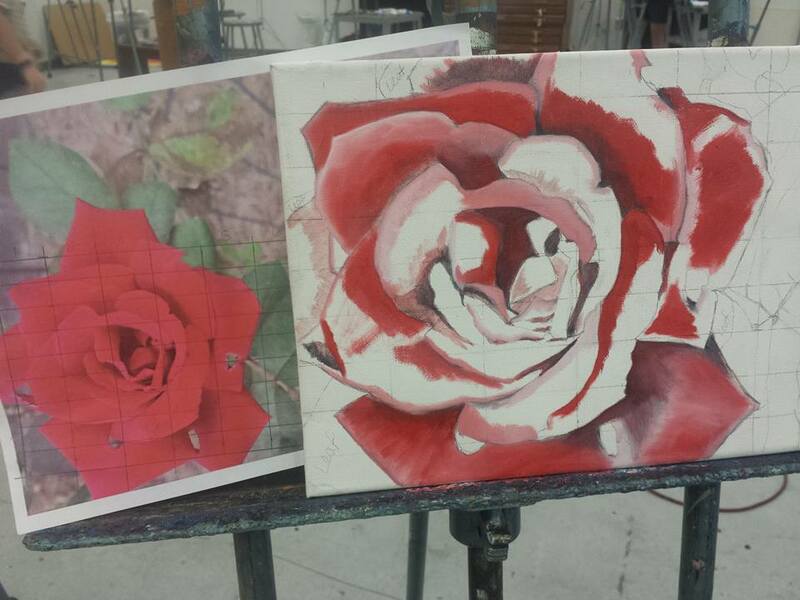 Painting The Roses Red continues. So maybe we don’t like the cards life deals us. No problem… Paint your roses red, change it! And don’t forget to sing while doing it. Be happy!!! If we are not happy with our outcomes we should be like the cardsmen and at least attemp a change. We need to do something to make it different. Maybe it will work. Maybe it won’t. But try with song and see what happen, life may surprise you. Looking in a whole different direction we can look upon a quote from William Shakespeare “Some are born great, some achieve greatness, and some have greatness thrust upon them.” The cardsmen were not born great but they definately did what they could in their situation to try to achieve greatness. Eventually they had greatness thrust upon them because they escaped the wrath of the queen. With the help of Alice they achieved greatness by overcoming and surviving the wrath of the enemy. If the queen’s cards can achieve greatness then so can we all. 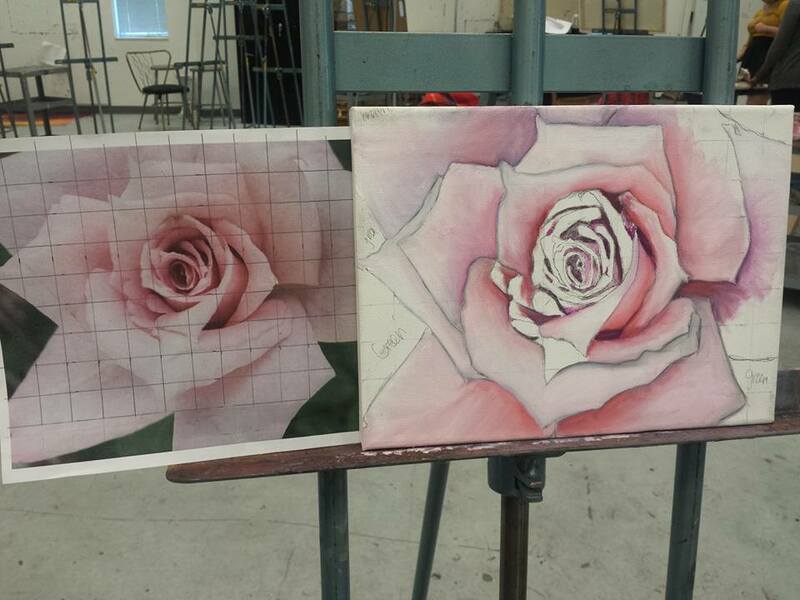 The beginning of the painting process for the 2nd painting. Let us all find inspiration in the cardsmen and try to achieve greatness. If we are lucky enough to have greatness thrust upon us hopefully we are able able to handle it, embrace it and make it into something even GREATER. 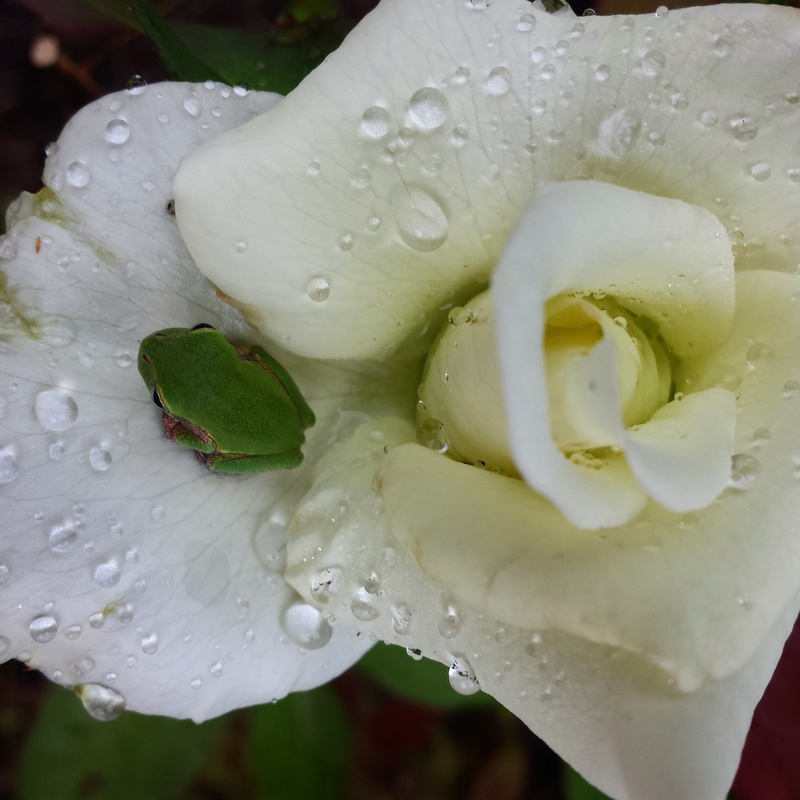 Sometimes even the craziest of situations, like being dealt white roses instead of red, can be overcome. I’ve learned from this series that sometimes we just need to paint our roses red and greatness may just follow. Because of these 3 roses I found my Wonderland and got “Lost in Wonderland”. More images and information on my body of work “Lost In Wonderland” can be seen at MicaJoy.com. Limited Edition Prints are available for all paintings, feel free to contact me for more information. These are My Life lessons from a Paintbrush, Alice in Wonderland and Shakespeare. Categories: ARTWORK, journey, Quotes | Tags: Alice in Wonderland, Lost In Wonderland, Mica Joy, oil on canvas, painting, roses, Wonderland | Permalink. As a kid my Mom and my Dad both would tell me to reach for the stars, shoot for the moon or the sky is the limit. They were trying to tell me that i could be great so that I would dream big! Well, I kind of took it literally when I was young. I once asked my Dad to pick me up so I could touch the moon. He would pick me up so I could reach out and touch other things and in my mind touching the moon was not an unreasonable request!!!! I mean, when you are riding down the road as a passenger in the truck at night and the moon is full, it’s just RIGHT THERE in the sky, a large yellowish orange circle! One that I should be able to touch. It was so hard for me to understand and accept the words my Dad kept trying to explain to me, “I’m sorry but I cant pick you up to touch the moon.” In my mind he COULD do that. The moon was not too far away, all principles of time and space were irrelevant and just INCORRECT as far as I was concerned. I never have figured out how to touch the moon but I am still trying to find a way. So what do the frogs have to do with the moon? 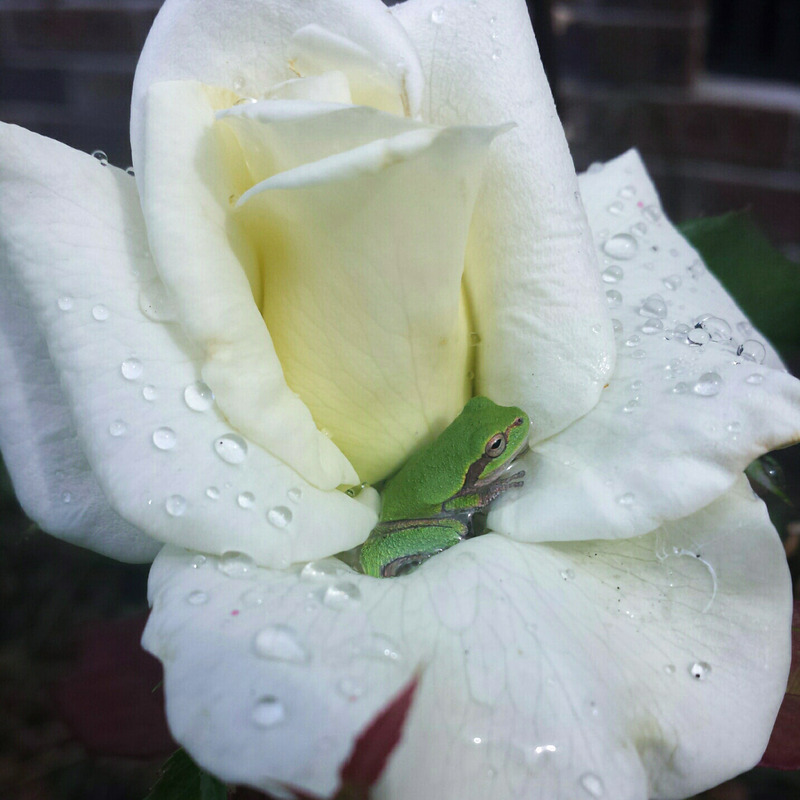 We are like frogs in this large universe ~ tiny little creatures. Maybe, like the quote says, we need to think larger than the frogs. We need to stop thinking the sky is only as large as the top of the well! My whole life I’ve been striving to reach the moon, Earth’s moon, when really I should have been reaching for ALL of the moons in all of the universes! 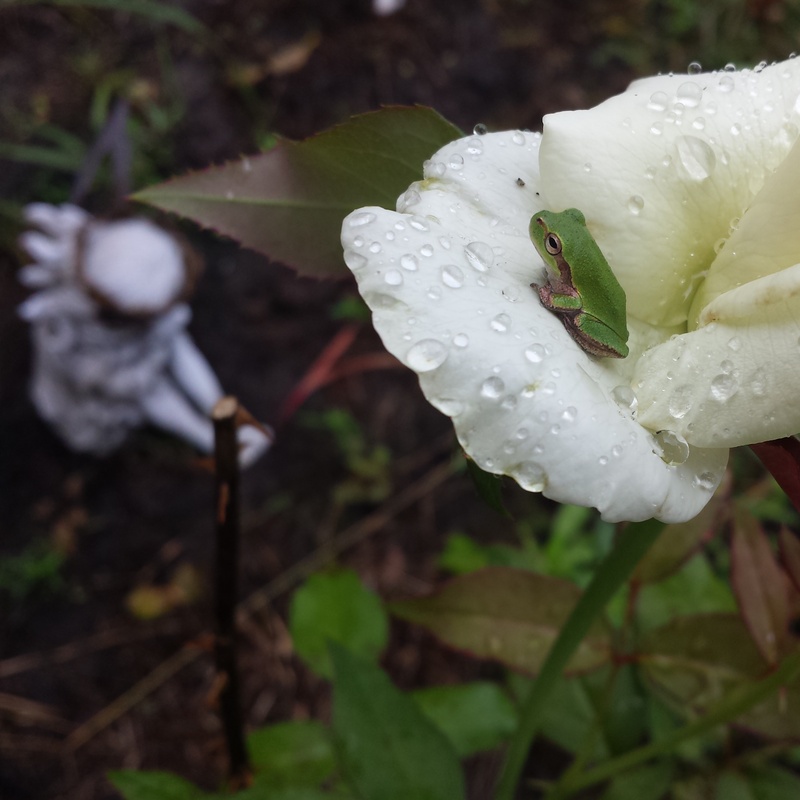 AND all I needed was a different view…the view of a tiny frog. Categories: Uncategorized | Tags: frogs, greatness, moon | Permalink. We all must think like a bee and create our own “prairies.” If something as tiny as a bee can take one small clover and make a prairie then surely we must all follow our dreams to create something great. 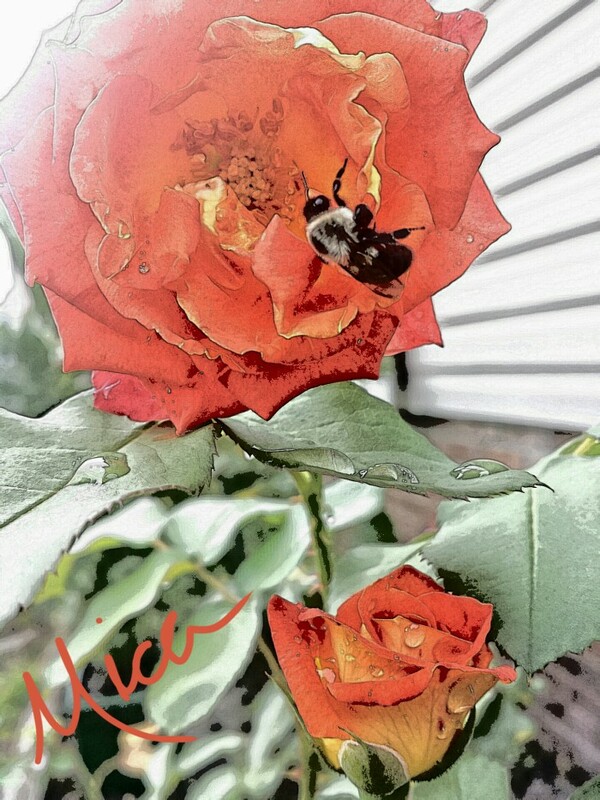 Categories: Quotes | Tags: bee, dreams, Emily Dickinson, Mica Joy Photography, my garden, rose | Permalink. I came across this quote the other day. I had never heard of Asha Tyson so I was curious to find out who she was. As it turns out, she is a motivational speaker now and has quite an interesting story. But, that is another story for another day. Her words here are powerful. The fact that our journey, whether it’s what we had in mind or not, was exactly what it needed to be is something to stop and think about. How often do you look back on your journey and think about the path that led you to where you are now? Too often we look at our past and we say, “Oh i wish I had done things differently,” rather than taking a moment to realize that it is our past, and the experiences we have, that make us who we are today. If you change your past then your present and future would be different and you would not be in the same now. With that being said, I have had a long journey to get where I am now. But I am here now and I am at peace with my journey! I do believe that each and every situation that I encountered had brought me to my now and that my now is right on time. Thank you Asha Tyson for saying it best – now is right on time! I am starting this blog to document my journey, my UNIQUE journey, and even though there were times in my past that I thought I should have started a blog and didn’t, now is right on time! Categories: journey, Uncategorized | Tags: journey, unique | Permalink. Follow Me - I will email you!